Seven Star Preying Mantis Boxing was created during the late Ming Dynasty in Shantung Province by a man named Wong Long. Wong Long was an expert boxer of several different styles who came to the Shaolin Temple to challenge the legendary monks to a fight. The Shaolin monks were known throughout China for their prowess in Wushu and were believed by many to be unbeatable. Wong Long wanted to see for himself if the legends were true. Wong Long reached the Shaolin Temple and challenged the head monk to a duel, but the head monk of Shaolin referred him to a novice student instead. To Wong's surprise, the novice monk easily defeated him. Ashamed of his defeat, Wong retreated to the mountains to improve his boxing techniques. After some time training, Wong returned to Shaolin to challenge the monk again. Wong defeated the monk who had previously defeated him and worked his way up to the head monk. Once again confident about his boxing, Wong believed he would defeat the head monk easily. But again he was defeated; every technique he threw at the head monk seemed to miss. Again Wong left the Shaolin Temple battered by the match and ashamed of his defeat. Longing to beat the Shaolin monks, Wong returned to the mountains to perfect his boxing skills. He practiced hard every day and every night. One day while resting after a long day of practice, Wong heard the shrill of a cicada. He then witnessed a battle between a cicada and a mantis. He thought the mantis would lose surely since it was much smaller than the cicada, but the mantis proved him wrong. With one fierce and fast strike, the mantis defeated the cicada. 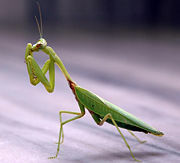 Impressed by the techniques of the mantis, Wong captured it and began to observe its fierce forelegs. With a reed stalk, Wong poked the mantis and observed its techniques. The mantis used its forelegs to strike the reed stalk and eventually got hold of the reed stalk. Wong then began to imitate the mantis' techniques and trained very hard. Happy with that technique, Wong still felt that something was missing. The movements of the mantis' fierce forelegs needed good footwork along with it. Wong then observed the movements of the monkey. The monkey was light on its feet and was very quick. So Wong combined the monkey's footwork with the fierce forelegs of the mantis and thus created the Xi Hsing Tang Lang Quan style (Seven Star Preying Mantis Boxing). Wong returned to Shaolin with renewed confidence in his boxing skills and challenged the head monk to a fight. Again the two met and this time Wong was ready for him; he easily defeated the head monk. The monk accepted that Wong was a superior fighter and inquired about the style he used. Wong explained that it was a new style he had developed, the Seven Star Preying Mantis system. Eventually this style was taught in the Shaolin Temple and became a major style in Shaolin Boxing. The Seven Star Preying Mantis Boxing Style is the original style which eventually gave birth to other mantis styles such as Six Harmony Mantis, Eight Step Mantis, Plum Blossom Mantis, and Closed Door Mantis. Today Preying Mantis Boxing is enjoying its success in Anchorage , Alaska , and throughout the United States. Master Kurt Wong of the Wu Tan Kung Fu and Tai Chi Institute learned the Preying Mantis boxing style from Sifu Su Yu Chang. 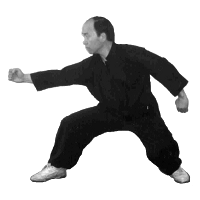 Sifu Su was known throughout Taiwan for his skills in the Mantis style; he was an expert in all the five major mantis systems. 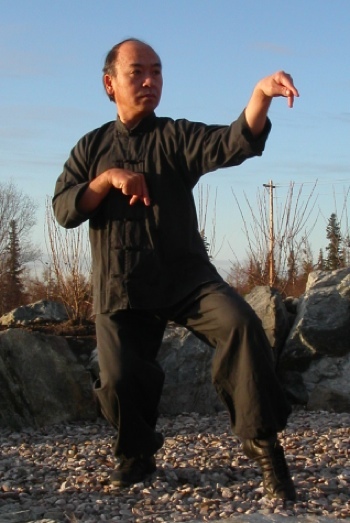 Master Wong learned several mantis styles from Sifu Su, including Seven Stars, Eight Step, and Six Harmony styles, and is now sharing his knowledge to his students in Alaska .